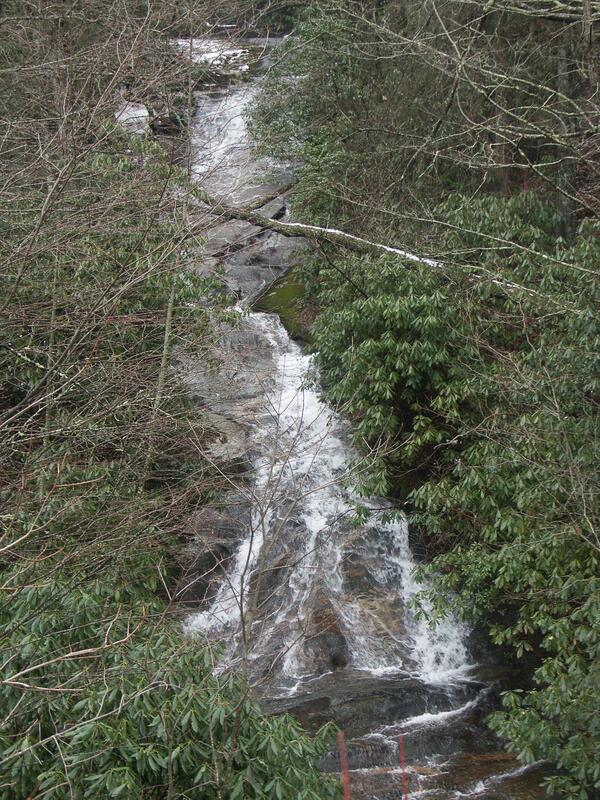 This falls begins as sliding cascade just uphill of NC Hwy. 28. The view of that part of the waterfall from the road is kind of ugly, though, and it's not safe to pull off. Cascades appear to continue downstream of the road, but they're not visible and on private property. Trust me - the picture I posted here is about the best you're going to see, during high weather with the leaves off. From the intersection of US 64 and NC 28 in downtown Highlands, NC, drive 2.3 miles South on NC 28. The road crosses over the falls here - slow down and look left and you might get a glimpse of them. But do yourself a favor, drive past this one about a mile and check out the view of Lower Satulah Falls just down NC 28. This waterfall is on private property, so you can't scramble down to them from the road.